For sale is one (1) Set of Twenty-five (25) Repurposed Upcycled Chinese New Year or World Thinking Day Scout SWAP or Craft kits. There is a limited quantity of these super cute SWAP kits. That’s why they are being sold as a set of 25 with a free sample included. These kits are made from a repurposed Chinese decoration, a lucky find and just perfect for creating 25 “limited edition” upcycled SWAPs! Each kit contains all the supplies necessary to make one SWAP: decorative cylinder, beads, split rings, safety pin, and home-made tassel. JUST ADD GLUE. 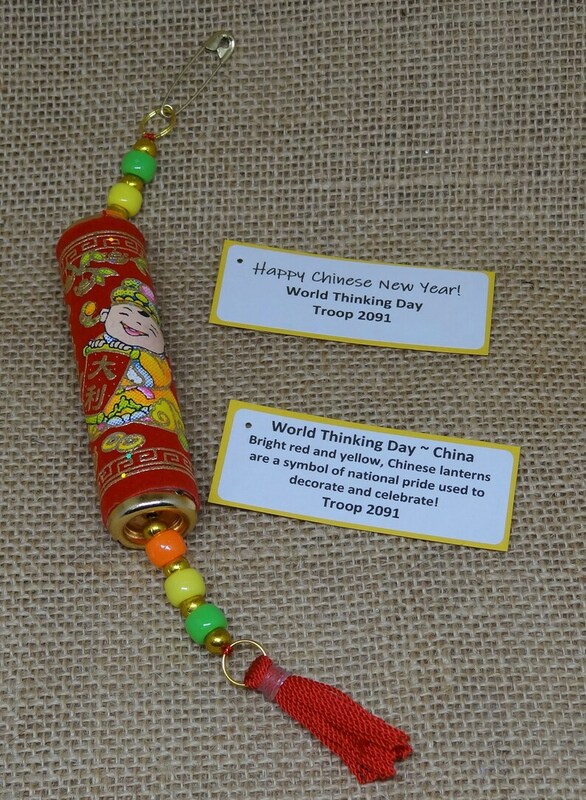 Once made, these SWAPs are perfect for celebrating Chinese New Year or World Thinking Day! All of our kits are individually packaged and ready to craft.